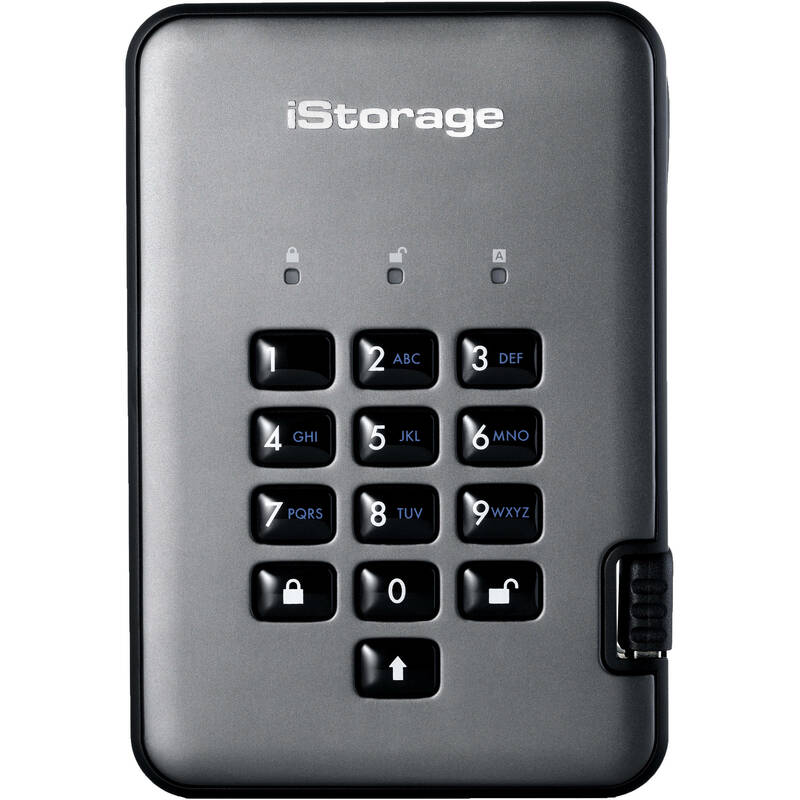 Take data security to a whole new level with the 2TB diskAshur PRO2 USB 3.1 Encrypted Portable HDD from Istorage. Boasting NCSC CPA, FIPS 140-2 Level 3, NLNCSA BSPA, and NATO restricted level certifications, this portable USB 3.1 HDD uses real-time AES-XTS 256-bit hardware encryption and PIN authentication to keep personal and corporate data safe while offering fast read and write speeds of up to 148 and 140 MB/s respectively. 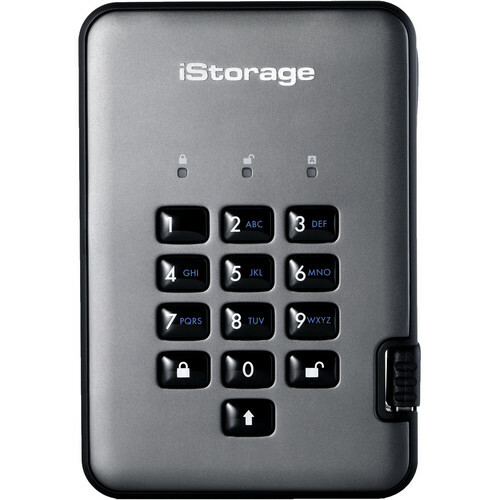 The diskAshur PRO2 HDD's easy-to-use keypad enables you to securely access your data with your own unique 7- to 15-digit PIN. One of the underlying security features of the GDPR-compliant diskAshur PRO2 HDD is its dedicated hardware-based secure microprocessor (Common Criteria EAL4+ ready), which employs built-in physical protection mechanisms to defend against external tamper, bypass attacks, and more. The diskAshur PRO2 HDD renders automated attacks useless by entering the deadlock frozen state. With software-free setup and operation, the diskAshur PRO2 HDD is platform/device independent and works across all operating systems including all versions of Windows, macOS, Linux, Android, Chrome, Thin Clients, Zero Clients, and embedded systems. The diskAshur PRO2 HDD offers advanced portable data security via a built-in FIPS PUB 197 validated AES-XTS 256-bit hardware encryption engine. The data encryption key is randomly generated by a Common Criteria EAL4+ ready random number generator and protected by FIPS validated wrapping algorithms. A dedicated onboard Common Criteria EAL4+ ready microprocessor enhances security through true random number generation and built-in cryptography. Active-shield technology and physical mechanisms protect the drive from external tamper, bypass laser attacks, and fault injections. The diskAshur PRO2 HDD's microprocessor reacts to all forms of automated hacking attempts by entering the deadlock frozen state where the device can only restart through a power-on reset procedure. The security lock feature protects the device against any unauthorized firmware modifications from the host side (fully protected against BadUSB). The microprocessor uses algorithms to encrypt both the data and the encryption key, giving you the peace of mind of knowing that your data is protected at any given time. Employing AES-XTS 256-bit hardware encryption, the diskAshur PRO2 HDD seamlessly encrypts all data on the drive in real time, keeping your data safe even if the drive is removed from its enclosure. With USB 3.1 data transfer speeds of 148 MB/s (read) and 140 MB/s (write), the drive gives you fast access to your files. The diskAshur PRO2 HDD is also backward compatible with USB 2.0 and 1.1 ports. The diskAshur PRO2 HDD is intelligently programmed to protect against all forms of brute force attacks. After five consecutive incorrect PIN entries the drive freezes, requiring the drive to be disconnected and reconnected to the USB port to get five further PIN entry attempts. If five further consecutive incorrect PIN attempts are entered, the diskAshur PRO2 HDD freezes again. To get five final PIN attempts (15 in total), the "shift" button must be pressed whilst inserting the USB cable into the USB port and then a preset PIN needs to be entered. On the fifteenth consecutive incorrect PIN entry, the diskAshur PRO2 HDD assumes it is being attacked. At this point the drive deletes the encryption key and locks itself, rendering all data previously stored on it lost forever. In such an event the drive can be reset to factory default settings and redeployed. You can pre-program the diskAshur PRO2 HDD with your own unique Self Destruct PIN which, once implemented, instantly deletes the encryption key, all PINs, and data, after which a new encryption key is created. The diskAshur PRO2 HDD can be set to automatically lock after a predetermined length of idle time. The diskAshur PRO2 HDD also employs a drive reset feature, which can be implemented with a unique command. This clears all PINs and data, and creates a new randomly generated encryption key, enabling the drive to be reset and redeployed as many times as needed. In addition to incorporating a secure microprocessor and encrypting the data and the encryption key, the diskAshur PRO2 HDD adds another barrier between your data and a hacker. All the components of the diskAshur PRO2 HDD are completely covered by a layer of super-tough epoxy resin, which is virtually impossible to remove without causing permanent damage to the components. This barrier prevents potential hackers from accessing the drive's critical components. Furthermore, the diskAshur PRO2 HDD provides visible evidence in the event of tampering. The diskAshur PRO2 HDD's wear-resistant epoxy-coated keypad hides key usage to avoid tipping off would-be hackers to commonly used keys.